There are so many amazing nurses that work tirelessly and rarely get the glory they so deserve. When I was pregnant with my miracle baby, all my prenatal visits were handled by an LPN who was absolutely wonderful. She had the best bedside manner, she was awesome at making me feel at ease (and not an archaic relic considering I was ‘older’ when I was pregnant and considered high risk). Nurses all over should be celebrated – and thanks to Johnson & Johnson, you have a chance to have your favorite nurse celebrated. 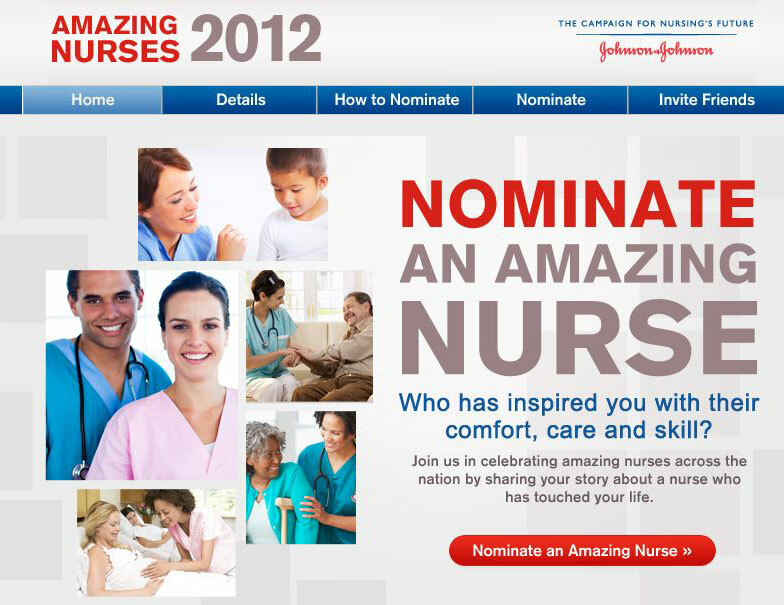 If you have an amazing nurse that deserves the praise, and would like to give them a chance to attend the 2012 CNN Heroes: An All-Star Tribute Show in Los Angeles, consider entering them in the Amazing Nurses Contest (last day to nominate is 6/29). Did you know… The healthcare field is experiencing a severe shortage of nurses; there is currently a nationwide vacancy of over 100,000 positions, and that number is expected to grow to 800,000 by the year 2020? Good News… A 20011 Gallup Poll announced that the public voted nurses number one for “honesty and ethical standards of various professions” for the 8th consecutive year. The Winning Nurse will also be featured on the Nursing Community, Nursing Notes – by Johnson & Johnson, on Facebook. When I was growing up, I always wanted to be a nurse, but as I got older, I realized I didn’t have the stomach to do the job. I didn’t think patients would appreciate me being green around the gills tending to their needs, or losing my lunch seeing a serious wound. Those in the nursing profession have my greatest respect for all they do. So what are you waiting for? Head over to the Amazing Nurses website or find them on Facebook and submit a nurse to the contest today. I wrote this review while participating in a blog tour by Mom Central Consulting on behalf of Johnson & Johnson and received a promotional item to thank me for taking the time to participate. See my Disclosure Policy here. This entry was posted in Alert, Announcement and tagged Alert, Announcement, bedside manner, healthcare field, honesty, Johnson & Johnson, lpn, nursing community, nursing notes, nursing profession, prenatal visits, shortage of nurses by Stacy (the Random Cool Chick). Bookmark the permalink. Two years ago I gave birth to an angel, the most beautiful princess to me. Through all the labor a nurse was with me all the time, taking her time to explain to me what was happening with my body and with my unborn girl. She was so caring, so gentle but after I had given birth I never saw her again. I guess now it’s the time to thank her. I will nominate her, but also pay a visit to pay her my deepest respect!